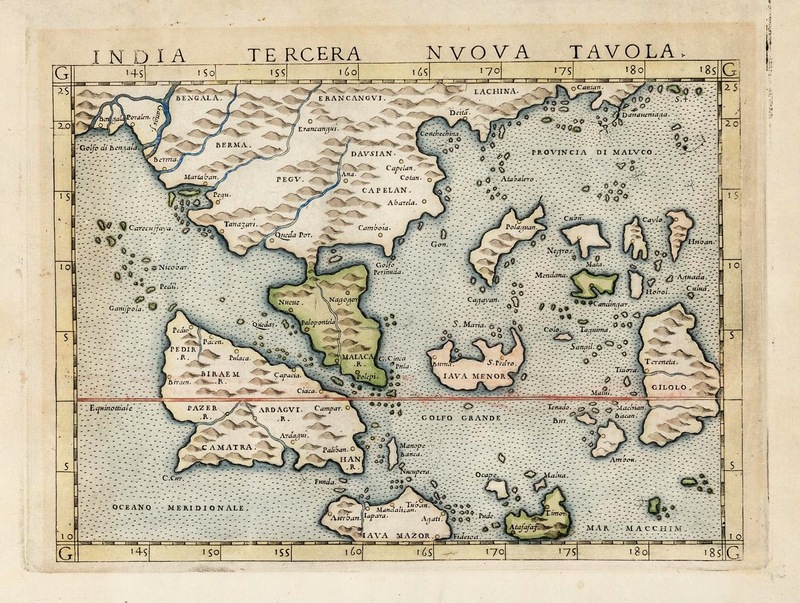 Antique Map South-East Asia by Ruscelli titled ‘India Tercera Nvova Tavola’. 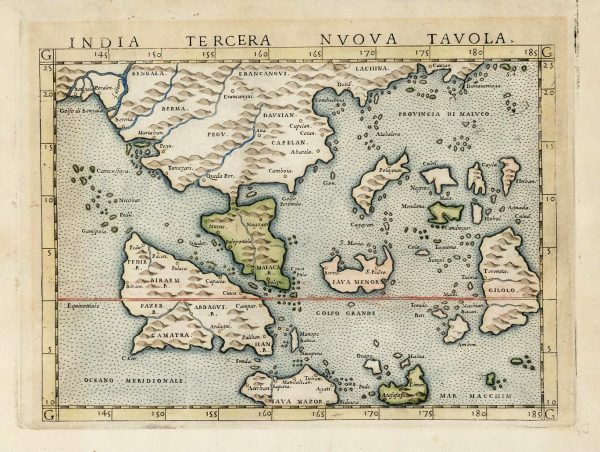 Early map of Southeast Asia based on Gastaldi’s foundation map (1548) of the region. Covers from the Gulf of Bengal to the southern coast of China and as far south as Java and Timor. The strangely shaped islands and early place names provide a fascinating early view of the region. Latin text on verso. Copper-engraved map, later hand-coloring. Girolamo Ruscelli (1500s-1566) was an Italian polymath, humanist, editor, and cartographer active in Venice during the early 16th century. Ruscelli is best known for his important revision of Ptolemy’s Geographia, which was published post humously in 1574. It is generally assumed that Alexius Pedemontanus was a pseudonym of Girolamo Ruscelli. In a later work, Ruscelli reported that the Secreti contained the experimental results of an ‘Academy of Secrets’ that he and a group of humanists and noblemen founded in Naples in the 1540s. Ruscelli’s academy is the first recorded example of an experimental scientific society. The academy was later imitated by Giambattista Della Porta, who founded an ‘Accademia dei Secreti’ in Naples in the 1560s.